The fall monarch butterfly migration is still going on in my part of North Texas for this year. I noted my first Monarch moving south in a facebook post on August 28 of this year. 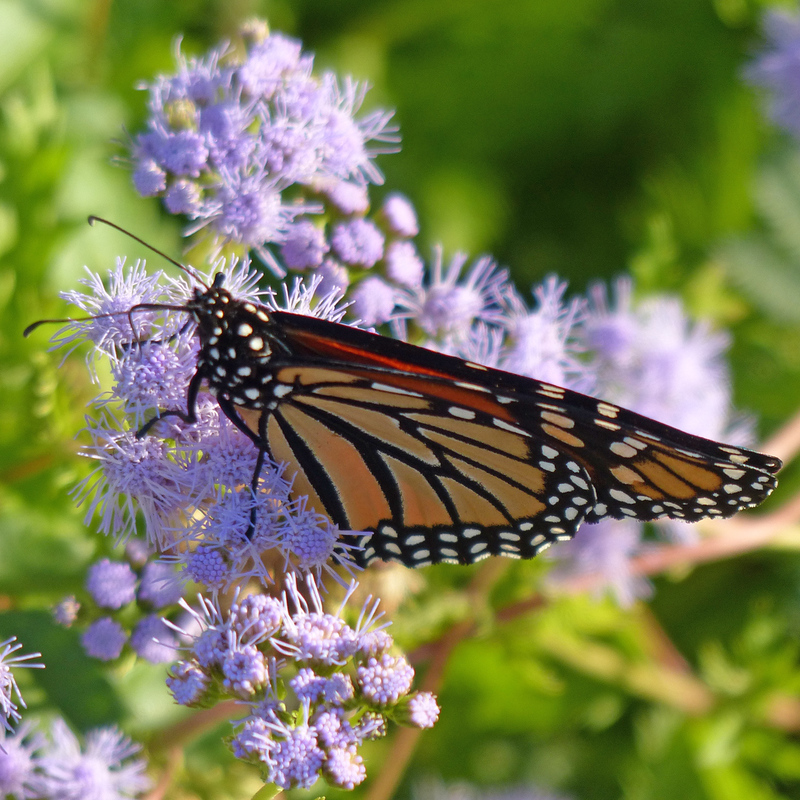 Several made their way through my yard today, stopping to refuel on my blue mistflower and lantana plantings. (Yes, I took these pics today.) The most I saw at one time today was four. I have been watching on and off since just before lunch. 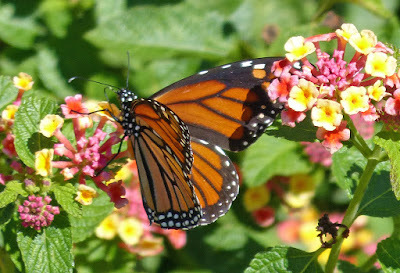 Monarch butterflies are such fascinating and beautiful creatures. You can follow their progress and/or provide data to track their progress with Journey North. This is another great citizen scientist opportunity. From the looks of the data, there are quite a few monarchs that are behind schedule in other parts of the country. You can feed migrating monarchs by planting nectar plants like those seen here. Find out specific suggestions for your part of the country on the Xerces Society website. 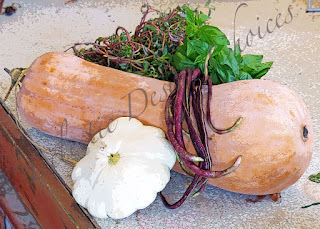 About three weeks ago I shared my trip to Eden's Organic Garden Center and CSA Farm. I mentioned in that blog post that I had turned a couple of the images I had taken there into new photographic art prints. In this post I will give a bit of a back story on how those images came about and show my photographic art images created from them. While I was waiting for the tour of the farm to begin, I shopped the organic produce offered for sale from local farms. I selected a couple of different types of squash and placed them on the counter. The purveyor was not there to check me out at that moment. I looked at the squash laying on the counter and thought it had the makings of a still life image. I took the liberty to add some greens and beans to the composition and scoot some of the other items on the counter out of the frame. I took a few shots and returned the items I had moved to their original locations as best I could. The size of the squash dictated a landscape orientation for the image and one whose aspect ratio worked well for a 5x7 print, which is what I developed from one of the images I shot. At one point in the farm tour, I glimpsed a commotion out of the corner of my eye. I turned my head to see something flying away from a large spider web. I asked if anyone else had seen what had happened and we went to look more closely at the web. No one else had gotten a better look. The spider was a large orb spider, however its web was missing its signature Z pattern. We surmised that a large grasshopper or cicada had likely been what we had seen escaping from the web and it tore up the Z section as it got away. 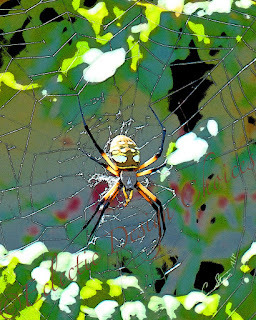 I managed to get a few shots of the orb spider in its disheveled web before the tour resumed. I titled the resulting 8x10 photographic art print "Just Missed". You can find more information about Eden's Organic Garden Center and CSA Farm on their facebook page. They host small neighborhood farmers' markets on the 1st, 3rd and 5th Saturdays of a month from 9am to noon (April - Dec.). Look for their sign out front and drive all the way back down the driveway to the big shade tree by the barn.